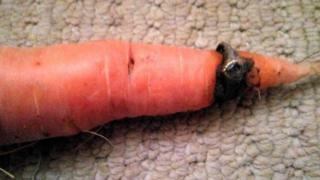 A gold ring that was lost in a vegetable garden 12 years ago has been found on a carrot dug up for dinner. Lin Keitch, 69, from Monkton Heathfield near Taunton, Somerset, noticed it while washing her home-grown vegetables. It had been a 40th birthday present from her husband Dave, and was lost by their daughter. The couple believe the carrot grew through the ring. Ms Keitch said it was a "chance in a million" discovery. "Dave dug up the carrots and left them outside the back door," she said. "I cut the greens off and scrubbed them, and I thought, 'What's that? Goodness, it's my ring'." She said even though the ring, with an amethyst stone in the centre, was covered in earth she recognised it immediately. Dave Keitch, 69, said he had looked for the ring regularly over the years "every time I do the garden over". He did not realise he had dug it up with the carrots last week. "When Lin put it in the bowl to prepare them for dinner she noticed it on the end of the carrot. She was over the moon. "She doesn't know whether to give it back to the daughter in case she loses it again, or keep it herself."